This episode of Investing in Real Estate is sponsored by ZipRecruiter! With their powerful matching technology, ZipRecruiter scans thousands of resumes to find people with the right experience and invites them to apply to your job. And right now, our listeners can try ZipRecruiter FOR FREE by visiting ziprecruiter.com/investing. This episode is also sponsored by CLEAR! CLEAR is the absolute best way to get through airport security. It works great with Pre-Check too! Right now, our listeners can get their first two months of CLEAR for FREE! Visit clearme.com/investing and use code INVESTING to redeem this offer. The reason why being a real estate investor is such a sustainable business is that people will always need a place to live. One demographic of tenants you might not have considered is seniors. Investing in assisted living facilities can be a great way to serve your community while also making a profit. Today’s guest is Gene Guarino, the founder and CEO of Residential Assisted Living Academy. Gene is here to share the details behind investing in assisted living facilities, including what to look for in a property, the earning potential, and how to find the best opportunities. We’ll also talk about how you can attend Residential Assisted Living Academy’s live training. 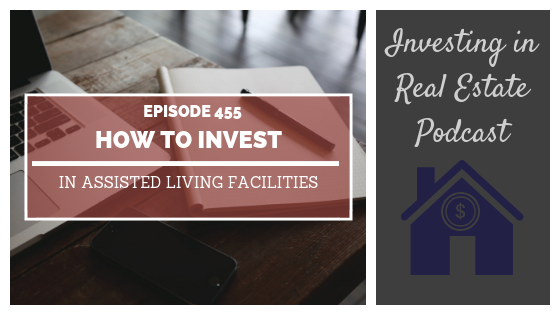 Don’t miss episode 455 of Investing in Real Estate! What kinds of homes are best for assisted living facilities. How much income you can make employing this strategy. How to find the right location for assisted living facilities. The barriers to entry for investing in assisted living homes. How to convert a property. What it means to be senior safe. Residential Assisted Living: Live Training!